March is upon us and the months are flying by, well to me it feels that way. This month’s block is slightly different. 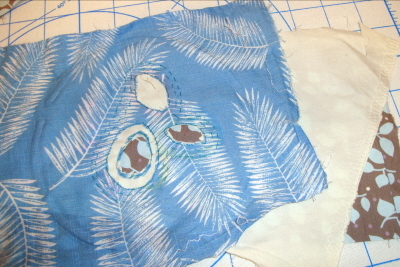 As it is reverse appliqué, this entails layers of fabric sewn together and sections cut out from the top layers. I hope you all had chance to purchase and find some good bold prints on your charity shop walks. Some of the information I will repeat each month, as a reminder to those that, like me have a bad memory. It will also aid those who have come to my blog for the first time and would like to join in for this particular block design. All blocks I aim to achieve with the use of second hand cotton fabric found in charity shops or donated from friends and family. Each block size will start at 11 inches by 11 inches and cut down to – not worked that out yet – inches squared once finished. 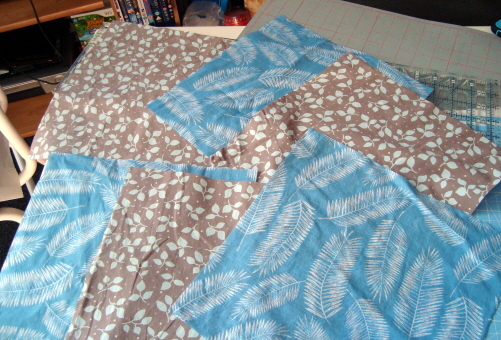 Using the fabric you acquired please cut a square 11 inches by 11 inches. Mark a boarder 1 ½ inches in, giving you roughly an 8 inches square area to work with. There are no templates required for this month. This month I will be covering reverse appliqué. 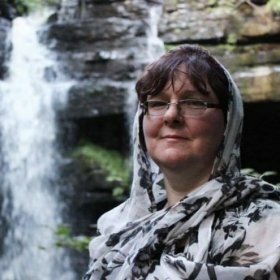 If you have spare of your chosen fabric, I would recommend that you do a test piece first so you can see what order you would like to layer up. 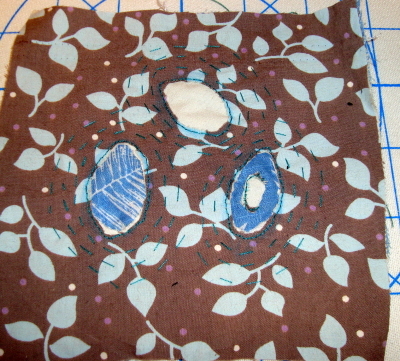 I tested on three layers but only ended up with my finished block using a top and a base layer. 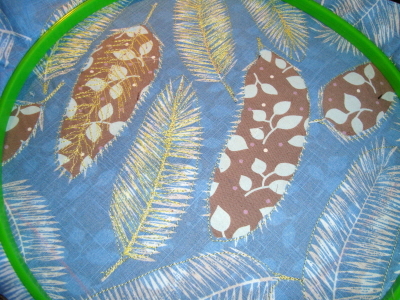 Using a 5 inch embroidery hoop -https://ukqu.co.uk/milward-embroidery-hoops-product-review-by-denise-inkson-aka-the-cheap-procrastinator/ – I layered two samples of fabric up. The first sample had the bottom fabric as the top, and top fabric for the bottom, sample two was the reverse of that. For both samples, I used three layers of fabric. 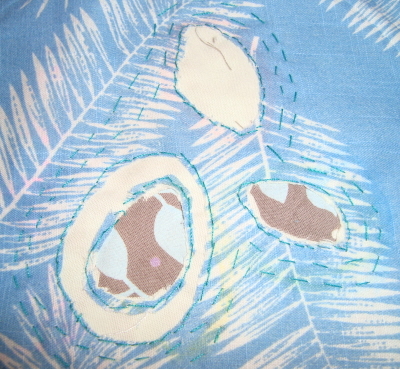 On sample one – bottom fabric as top – although the print was bold, it was too small for me to use as a guide. Instead, I drew leaf shapes with tailors chalk and used those outlines instead. 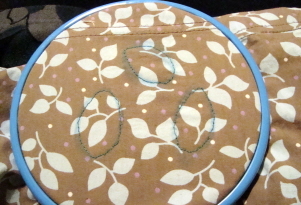 I hand sewed around these shapes with a small backstitch. Once sewn, I used a sharp pointed pair of scissors and cutaway the first layer on one leaf, and through the first two layers of the second leaf. 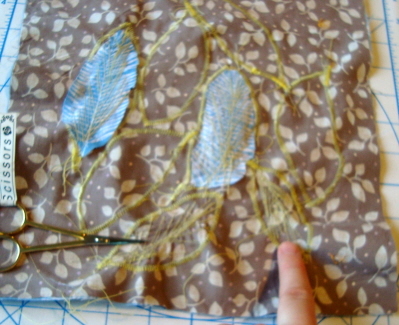 On the third leaf, I drew a smaller leaf within a leaf and sewed the outline of that. 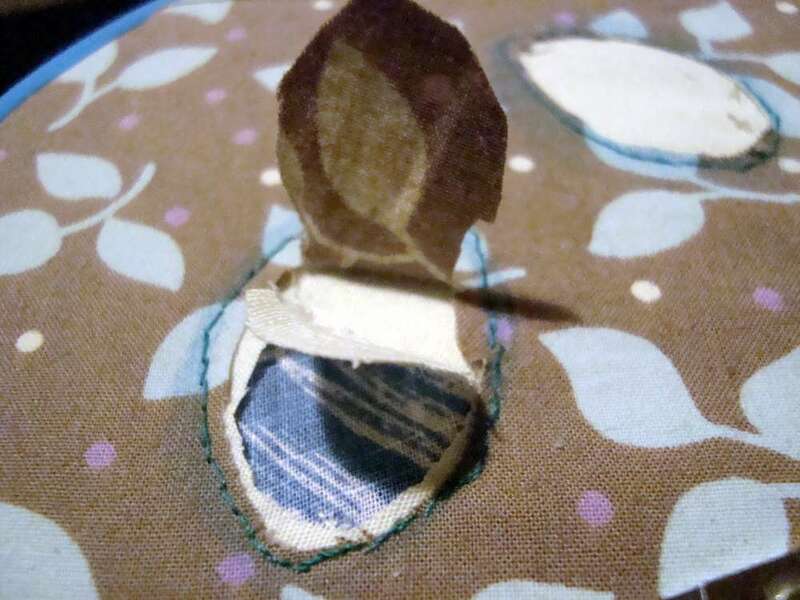 I left the inner leaf with the second layer showing and the outer layer had only the bottom fabric on view. See picture for a better understanding. 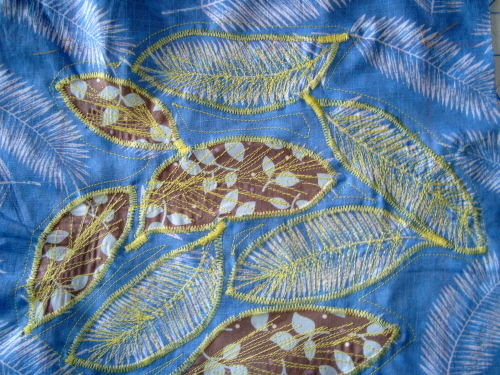 I then echo quilted around the leaf shape twice and once around the whole design. I did the same technique as on sample one, with different layers of fabric showing in different parts. I only echo-quilted twice around the design to demonstrate another echo quilting method, for those that do not know echo quilting is where you have lines radiating out from the edge of a design. 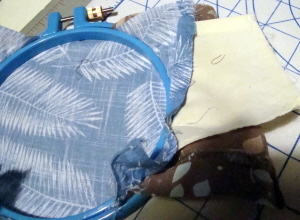 I chose to do the sample two fabric combination but minus the middle layer. I wanted to keep the thickness of this block similar to the other blocks on this project. 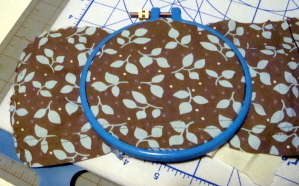 I also did not have enough fabric to do three blocks and wanted to keep it simple. Although these sample blocks were hand sewn, I will be showing you ones I have made with the sewing machine, both a free-motion version this was moved freely by hand with the feed dogs down and a machine-controlled version, where I stopped and started the machine and went in the direction of stitch with the feed dogs up. 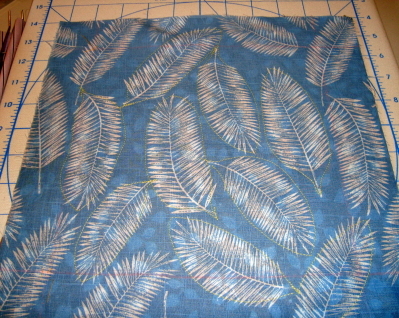 My top print has very bold feathers; it is the feathers I am going to sew around and echo quilt. 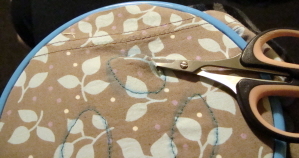 The free-motion on my echo quilting is not very good, and on my machine, the outer line is all I had room to do. • First, I outlined edge of the feathers I wished to use. 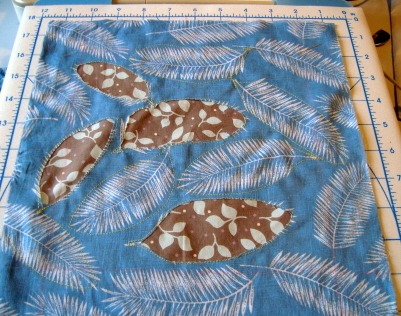 • Then I cut out the sections on some of the feathers. • Followed by zigzagging around the inner edges of all the feathers. 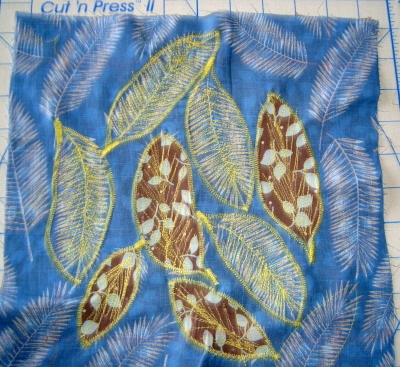 • Then on all the feathers, I sewed the area to highlight the feathers on some and the void feathers on the others. • Finally, I echo quilted around the design. 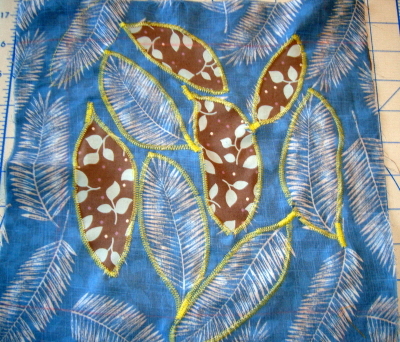 Because I held my block in an embroidery hoop while I free-motioned the feathers it kept the fabric on the single layer of the leaf from puckering. 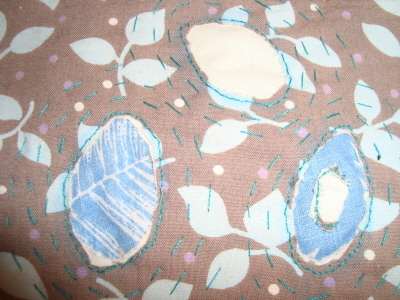 However, when I did machine controlled using forward and reverse stitches on the single leaf layers it puckered. 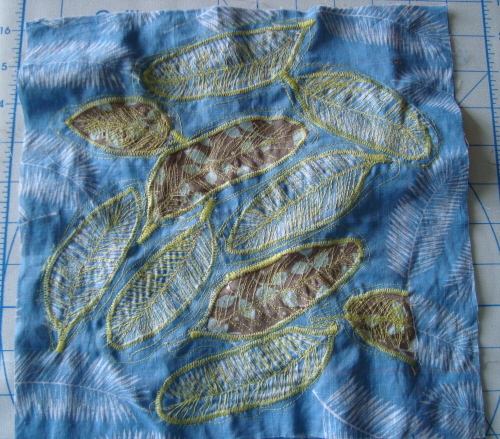 My solution was to quilt over the leaf with the leaf shape, from the top and replaced onto the bottom, again see picture for reference. This block is what I class as a filler block and might not be used in the over all finish of this project, depending on my mood or the eventual look of it. You may have found, like me that the print you picked does not always work. There is no error in this and it is all part of a creative journey. … A tip, look for plain colours. The Cheap Procrastinator – New you and away to sew! The Cheap Procrastinator – All the small things you can do; Kantha Quilted Pincushion The Cheap Procrastinator – Machine and You! The Cheap Procrastinator – Procrastination Central: Best laid plans of mice and men and motif madness.